This article explains the Greiner Growth Model by Larry Greiner in a practical way. After reading you will understand the basics of this powerful business life cycle tool. What is the Greiner Growth Model? Organizations are always under way and according to the American organizational expert Larry Greiner, comparisons can be made with living organisms that go through several growth phases. In 1972 he described an organizational growth model for enterprises, in which he initially proposed five stages. The growth towards a next stage is accompanied by resistance, which is also referred to as growing pains. Greiners Model of Growth, Greiner’s model of organizational growth or the Greiner Business Growth Model is a popular strategic management tool which is very often used in today’s modern businesses to make the right strategic decisions. The only variable in the Greiner Growth Model is the time factor. The Greiner growth model is a descriptive framework in which the age of the organization is marked out against the size of an organization. Larry Greiner assumes that an organization grows and expands throughout the years. The Greiner Growth Model makes it easier to understand why management styles, organizational structures, coordination mechanisms work and why they do not work at certain phases in the development phase of an organization. Every phase requires different competences of the entrepreneur, as a result of which the Greiner Growth Model orients towards strategic policy. Larry Greiner originally described five phases of growth in his Greiner Growth Model to which he later added a sixth phase. Each phase ends with a short crisis/ growing pains after which the next phase begins. In this pioneering phase of the Greiner Growth Model, the company is young and relatively small. The organization is informal and the employees are very loyal. There is a flat organizational structure and the entrepreneur is externally oriented; he invests in new clients. Because the organization is growing (too fast) and is becoming more complex, the entrepreneur is no longer able to take stock of the situation and a leadership crisis arises. Coordination and internal control can no longer be carried out by one person. There is a need for an improved structure. In this management phase of the Greiner Growth Model, functional managers are appointed as a result of which a middle management is created that controls the primary processes. Rules, procedures and business are formalized and standardized. The central coordination remains in the hands of the entrepreneur. Because of further growth, the coordination problems may become too big for the entrepreneur. In addition, middle managers need more autonomy. The autonomy crisis is born. In this phase of decentralization, the entrepreneur delegates important tasks to his middle management. Results are aimed for and the middle managers are responsible for achieving tactical and operational objectives. Management moves at a strategic level and rarely intervenes. A division structure is created with separate product groups and individual managers. The more divisional managers, the more difficult it will become for the management board to coordinate all the divisions that operate independently. There is a risk of a management crisis. There is a good chance that the divisional managers plot their own course too much as a consequence of which the company could break up. In the standardization phase of the Greiner Growth Model, more emphasis is put on the coordination between the various units. In large diversified organizations the various staff departments take up a strong position from the headquarters from which the divisional managers are managed. When the staff departments have too much power and when there is too little scope for the divisional managers, a red tape crisis arises. The rules have made the company too inflexible and rigid. In the cooperation phase of the Greiner Growth Model, cooperation between line and staff departments is aimed at and this creates a break-up of the hierarchical coordination forms such as a matrix structure or a project organization. This phase is characterized by much mutual contact between employees via all kinds of consultation groups. There is little formalization and standardization. The frequent consultations constitute a pitfall, as a result of which a consultation crisis may arise. There is every chance that supervision and control decline sharply. This could mean the end for organizations, unless they develop through external alliances. In this ‘growth through undertaking phase’ the organization only requires good external contacts and alliances. These can be found in mergers, alliances and extensive networks. Because an organization is more focused on alliances than its own core-business, there is a good chance that an identity crisis will present itself. The organization is taken over completely by other businesses and the ‘old’ situation will disappear completely. 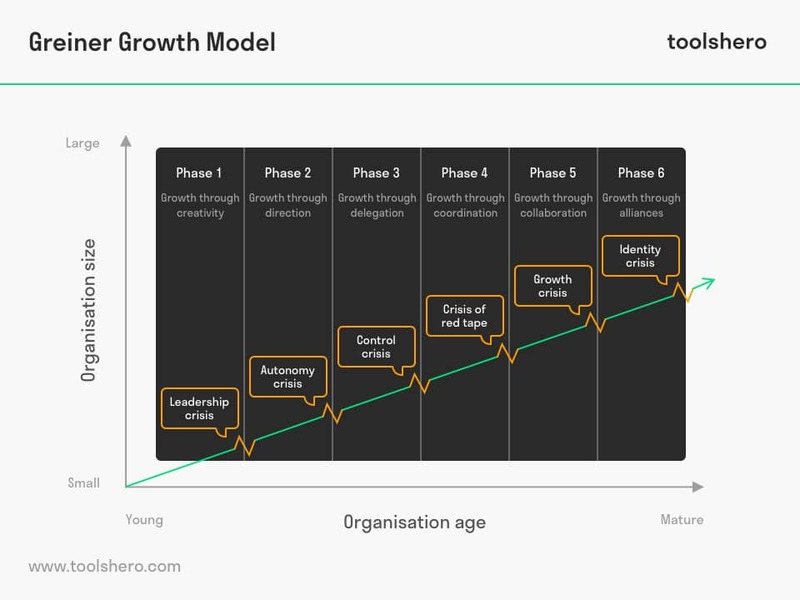 By providing an insight into the growth phases, the Greiner Growth Model can be a tool for organizations to tackle the subsequent growing pains. Organizations will be prepared for any possible growing pains, so they can anticipate them. However, they cannot determine the exact moment growing pains present themselves as it is not possible to determine the duration of a growth phase in advance. Growing pains can also have a positive effect on a company. These growing pains are experienced as something negative by the parties involved, but essentially they are an excellent means to shake up the organization and make everyone aware that it is necessary for them to embark on a new course. What do you think? Is the Greiner Growth Model applicable in today’s modern companies and businesses? Do you recognize the practical explanation or do you have more suggestions? What are your success factors for the healthy business life cycle? Greiner, L. E. (1997). Evolution and revolution as organizations grow. 1972. Harvard business review, 76(3), 55-60. Greiner, L. E., & Metzger, R. O. (1983). Consulting to management. Prentice-Hall.